Create abundant storage in your work space by adding the Bush Business Furniture Series A Collection 48W Corner Hutch in Beech for open leg table design provides flexible solutions. Both convenient and attractive, this Hutch offers open storage with two fixed shelves and four adjustable shelves which clean up your desk area with concealed storage. Includes two doors with self-closing Euro-style hinges for a soft close. Easily mounts onto 48W Desk for increased storage options that customize your office. The 48W Hutch accepts a Task Light above the fabric covered tack board and allows you to keep unsightly cables hidden with integrated wire management grommets. 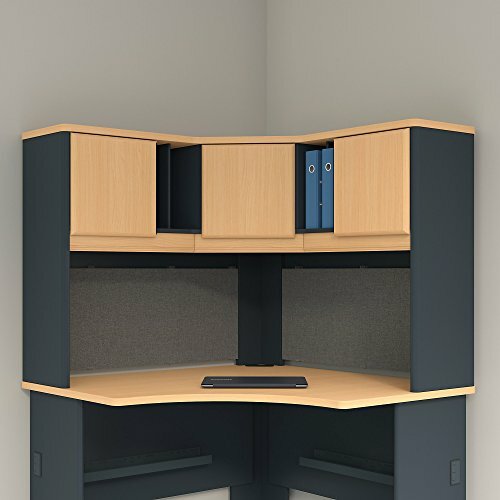 The finished back panel enables the Hutch to be used to divide workstations, plus the height matches Series A Bookcases for side-by-side configurations. Solid construction meets ANSI/BIFMA test standards in place at time of manufacture. The Series A Collection is backed by the Bush Business Furniture 10-Year Warranty. American made with U.S. and imported parts.